What does one do after this Capitals season? When you watch an ending to a season like last night’s game 7, all you could feel in your whole body is the same when you watch something so horrible that you can’t look away: numb. Absolutely, sickeningly numb. One would be smart to say that I should turn off the TV and do something else. But once you saw the Boston Bruins come back from 4-1 down, you thought anything was possible. Damn you Joe Beninati for making me gullible! Instead, you remember what it is like to be a Washingtonian who loves sports. There is a reason the fans filed out so fast. You can always count on the professional sports teams for being disgracefully incompetent when they are needed at their most. Now it’s up to “Davey Johnson’s last ride” Nationals to put an end to this disgraceful 21 year title drought. You can’t question Alex Ovechkin’s effort from his dozen or so hits, but his creativity and flair on offense has been battered down from sophisticated defenses along with hypocritical and the same unintentionally racist comments from the media for the last three years. To make matters worse, the offense was down for the count ever since Martin Erat went down with that left wrist injury in Game 4. It was nice to bring in the 19-year-old sensation Tom Wilson for Game 5 onwards, but when you bring him in without any NHL experience instead of some form of a proven goal scorer like Wojtek Wolski in the most critical part of your season, that is head coach Adam Oates’ way of saying how much this organization lacks any scoring depth whatsoever. The problems just continue from there. In the playoffs, not only do you need mental and physical toughness, but you also need speed to get through the more congested space that is one can’t practice during the regular season. Like 2011, John Erskine was nothing short of a cult hero to all in DC, but he proved that he is too slow to ever be good enough to be a top six defenceman on a Stanley Cup championship team. The same goes for Jack Hillen, a lifetime seventh defenceman and Steve Oleksy, a lifetime minor leaguer. They were all great feature stories, but real top tier professionalism, skill and know how are required to win championships. That leads us to the mystery man, Mike Ribeiro. Round two of “what should we do” columns are coming up and thousands of words aren’t enough to analyze what the right move is. The truth is that Washington has less than $6 million to spend until they hit next year’s salary cap. However, almost all of it will be used to resign restricted free agents Karl Alzner (without any analysis until next month, $2.5-3.5 million per year for about 3-5 years), Marcus Johansson ($2-$2.5 million for four years maximum) and maybe Tomas Kundratek depending on where he stands in the Capitals organization (less than $1 million for three years maximum). Almost every unrestricted free agent not named Ribeiro should not be resigned, so there are no issues on that. Yes, Matt Hendricks is on that unsigned list, but odds are Wilson and prospect Michael Latta can come in next year and do his job at either a more youthful exuberance with more scoring touch or at a cheaper price and that makes him expendable. That means George McPhee will have no choice but to trade someone in order to make room for Ribeiro and other free agents. Joel Ward, Jason Chimera and Jeff Schultz’s press box seat are the top candidates for trade bait. But to say the least, like what was mentioned last month, George McPhee basically has to hold the fort. When the proper amount of homework is done, the negotiations should state that 4 years/$19 million is the offer, take it or leave it. Sure, I picked this Capitals team to make it to the Stanley Cup finals, but I honestly thought the bad Corsi would improve instead of the PDO getting worse. Oh puck luck indeed! Also, the Eastern Conference this year became Pittsburgh, and everyone else as the likes of Montreal and Boston limped to finish the regular season after their strong starts. It will take more Paul MacLean magic, Craig Anderson and a few dirty hits and absolute nastiness from Chris Neill and company to prevent the Penguins from reaching the Cup finals because the New York Rangers lack any depth to replace their key injured players to stop them and once again, Bruins fans are wondering if Tyler Seguin and Brad Marchand will ever breakout into their primes. And that’s why this elimination hurt. Sure, the Caps have had worse eliminations. The 2010 Montreal series will forever go down as the most inexcusable in my lifetime and Washington showed no toughness in the 2011 Tampa Bay series despite being forced to play Sean Collins and his now 21 career NHL games on the blue line in the deciding game four. This year’s team may have not been a guaranteed Stanley Cup contender, but if things fell into place, they had a chance and they absolutely blew it. Sure, Montreal, Toronto and the New York Islanders would have said the same thing, but they don’t have the players, the playoff experience and the “this is our time” momentum this Caps team has. The other sad thing is that I don’t know where Washington goes from here. I still give credit to them for staying strong minded during some horrible times in the regular season and getting the ship sailed in the right place in the end. But like the Nationals last fall and the Redskins last winter, when you have a chance at a championship with everything falling into place, you better not blow it because who knows if you’ll ever have that opportunity again. 2010 was that year and I don’t know if the Capitals have another guaranteed chance with this generation of players. In American sports, every sports team has a potential title contender every 20-25 years. Examples include the New York Yankees (1977 to 1996), Boston Red Sox (1986 to 2004), Pittsburgh Penguins (1991 to 2009), New York Giants (1986 to 2007), Boston Bruins (1991 to 2011), New York Rangers (1994 to 2012), Philadelphia Eagles (1981 to 2005) and the Boston Celtics (1986 to 2008). You shorten that span, and your front office is among the greatest of all-time. Examples include the Detroit Red Wings (1997 to 2008), Baltimore Ravens (2001 to 2013), Green Bay Packers (1996 to 2011), Philadelphia Flyers (2004 to 2010) and Los Angeles Lakers (1990 to 2000). You lengthen that span, and the fan base will almost never forgive you. Examples include the Washington Wizards (1978 to TBA), Kansas City Chiefs (1970 to TBA), Oakland Raiders (1984 to TBA), Cleveland Browns (1988 to TBA) and the Baltimore Orioles (1983 to 2013 or 2014?). 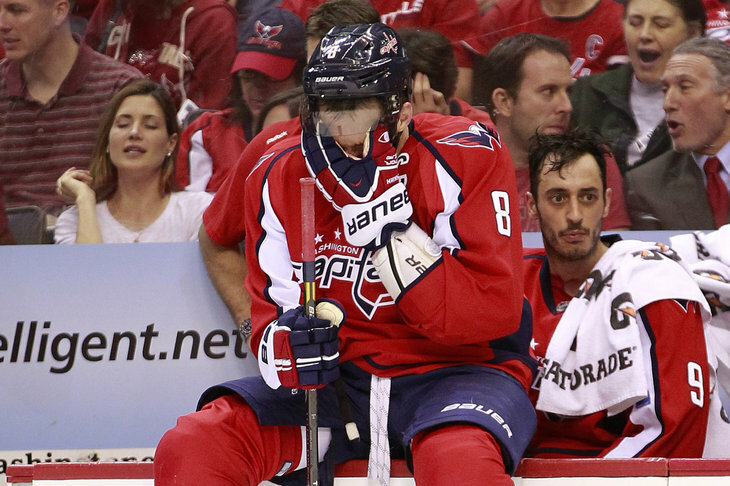 For now, the Capitals are stuck in between average and lack of fan forgiveness. Sure, the Caps have had the Langway Era in the mid 1980s to the Ovechkin era in the late 2000s as their golden generations, but 1998 was the only time they ever made it beyond the second round of the playoffs. My point is that average franchises are stuck with a generation from a title contender and will have to wait another 20-25 to get the next great one. Can you really tell me with a straight face that George McPhee can trade Ovechkin, Nicklas Backstrom and Mike Green, draft highly with success and have a contending team with the exact same or higher expectations within a very short span of time? Odds are no chance. The best case scenario for the Capitals is that they take advantage of their late first round picks and keep restocking the talent pool. You hope that a few of them pan out into top five point producers (Marcus Johansson) or top four defenceman (John Carlson) and hope for the best. Philadelphia did that with Mike Richards and Jeff Carter, San Jose is doing that with Logan Couture and the New York Rangers are doing that with Derek Stepan. Add smart and shrewd signings and trades and the window is still open again. But Washington has officially blew it’s chance of becoming a potential dynasty like Pittsburgh and Chicago could be. That is what’s so depressing. Until the Ovechkin era is over, we are stuck like the rest of the NHL fans and hope that lady luck comes to our side and leads us to the Stanley Cup. ← Who will win the Stanley Cup?